It was the sort of week that goes by without being captured on film. Or pixels. We started off with a trip to the doctor for Farmerboy, who was diagnosed with a sinus infection and prescribed antibiotics. In the middle of the week, I had a doctor's appointment. Then on Friday it was back to the pediatrician for Katydid and Pip, after a loooong night of coughing. More antibiotics. I was sick -- not too sick, but sick -- for most of the week, too. But it has meant a lot of draaaaging in the mornings. And a bit of fretting, since I was just scheduled for my C-section: June 15. I am only fretting because I have to meet the requirements for New York state's homeschooling laws, which require me to document 180 days/900 hours (990 for Gareth) and turn in quarterly reports on everyone and (because we aren't testing this year) yearly evaluations, too. I make this all harder on myself by actually providing a narrative. Quarterly reports are about 2 pages long; yearly evaluations about 3. I could have given the kids standardized tests this year, but that takes so much time out of our normal routine (going through the test prep book, taking a week out to do the testing...) that we only do it when we have to. Listened to the song of a Baltimore Oriole. Read an old I Can Read! book about Baltimore Orioles the doctor's office conveniently put in their waiting room for us. Tried to watch the History Channel's new series America: The Story of US, which we have DVRed. The problem is that the episodes the boys are most interested in -- the Civil War episode, for example -- are quite graphic for prime time TV... in my opinion anyway. It was a good thing we had the episodes DVRed so we could fast forward through the gorier parts, but the younger boys were not happy at having to miss the battle scenes. Watched some John Wayne movies. Does that count as school? Did a little math. Gareth wrestled with functions. Farmerboy worked on telling time. Used the markers. Sometimes even on paper!! Decided that Gareth will be adding Greek to his schedule next year using the textbook Athenaze. Built tractors out of Legos. As for me, I dug Women with ADD out of my "to be read" stack and started reading it again. I had, um, lost it actually (I should probably insert a blush here at the irony) when I started reading it before we left on our trip to Tennessee. I had been planning on reading it in the van. Anyway, it's been sitting on my nightstand for a while, but last week was definitely the time to pick it up again as much of the world which I have responsibility for managing and organizing seemed to be growing ugly people-eating tentacles at an alarming rate. Anyway, I am finding the book quite helpful and when I finish it I do hope to post a review. If the tentacles will behave, of course. I am sitting here in the family room on a Sunday, with Pippi Longstocking playing in the background, the Daytona 500 on the TV on mute for Andy, Gareth playing Toon Town on the computer, and an 18 month old who should be asleep running around wreaking havoc. So of course I thought it would be the perfect time to write a post about junior high and high school at home. Gareth turns 13 this fall and will enter the 7th grade. I'm thinking of this as "junior high", because New York's homeschooling laws change after 6th grade. As of 7th grade, the law requires that homeschoolers complete "units", not unlike those required of high schoolers for graduation. (Actually, the same definition of "unit" is used for both 7th and 8th grades and high school: 6480 minutes. No, New York could not come right out and say 108 hours. 6480 minutes, and not a second more.) So in 7th grade, we will have to document 108 hours (6480 minutes) of English, 108 hours of history and geography, 108 hours of science, and 108 hours of math, and provide "regular instruction" in health, "practical arts", and library skills to equal 990 hours a year. At some point in the next two years, Gareth will also have to complete 54 hours of art and 54 hours of music. Now, this is not really a big deal; we do more than 990 hours a year anyway. But in the process of doing my mid-year tweaking, and in checking the laws for next year, it suddenly dawned on me... I am going to have a teenager. And it also dawned on me, he will be in high school in two years. And then I realized, he's almost done with Saxon 7/6. What next? He's not ready for algebra, is he? I'm trying to do something novel. I'm trying to be prepared. At this stage in the game, I know that Gareth learns best with materials he can use independently. I know that he needs to follow his interests and exercise a certain level of choice in his studies, but I also know that he needs some structure imposed from above, as it were. I know that he needs time to prepare for changes, and that he needs to know what to expect ahead of time. And I also know that his particular mix of intellectual giftedness and learning disabilities (what the educational establishment now refers to as "twice exceptional") means that we often have to meet his needs in creative ways. We have to be willing to ditch grade levels, which are kind of irrelevant when your twelve year old is reading a technical book on prehistoric mammals written for adults AND struggling with a third grade spelling workbook at the same time. But we also have to know how to work the system. This is becoming important right now, since he might conceivably do high school level work in more than just Algebra I in the next year or two. So here I am, reading, reading, reading, googling, googling, googling, immersed in a strange world of "credits" and "transcripts" and "course descriptions". It seems like there are two common responses to high school in the homeschool. The first is to go the traditional route -- sign up with a curriculum provider, focus on academics, add in a hefty dose of extracurricular activities. The other response seems to be along the lines of, who needs college? Think apprenticeships, exploring interests. But I have seen glimmers of a middle way, and I think that is the path we want to trod. "Practical bookishness," as David and Micki Colfax named it. Should a teenager read Homer? Yes. Should he be able to build a chicken coop, fix a car, and/or make himself dinner? Yes. Should he be able to draw as many imaginary creatures as he wants, write novels instead of papers, and read stacks and stacks of science fiction novels to the exclusion of all else? Well... yes and no. (And I say this AS an SFF writer who wrote novels and read stacks of SFF mainly during class as a teenager.) If a twelve year old says he wants to be an astrobiologist when he grows up (yes, an astrobiologist), or an archaeologist, or a paleontologist (as well as a dad), how does one prepare him for that? So here's where the research comes in. Right now I'm just becoming educated about the big picture. How does a homeschooler apply to college? What do colleges want from homeschoolers? What's a credit, and how do you put together a transcript? Will it be better to sign up with a traditional curriculum provider starting in 7th grade or to go our own way? Through all this, I'm thinking about our philosophy, our faith, and -- most importantly -- what will benefit Gareth. And if homeschooling Gareth has taught me nothing else, it's that nothing we do will fit into anybody else's holes. If there are square pegs and round holes -- we're trapezoids. I just wanted to say: I have hit a wall. Any woman with six children should be able to buy executive functioning (the part of your brain that helps you plan stuff) over the counter when she needs it. You know, like vitamins. Say, when she is trying to prepare for a vacation and a new school term at the same as she is researching the probability that her twin toddlers have sensory integration difficulties and she is also trying to decide whether or not to bring all or only some of the tomatoes in, because the forecast changes every fifteen minutes. In this scenario, without supplemental executive functioning, she is likely to give pride of place to the tomatoes. My wonderful husband bought me a fancy new laptop to replace the one I burnt out at the beginning of the summer. This fancy new laptop came with Windows Calendar, which I am using to make up a schedule for our fall term. My goal is to start up again on September 22. I'm not sure we're going to make it that long, considering that my kids are reacting to this "break" the way they react to all breaks -- in other words, not very well. But I still have a few things to do. Like clean off the table. And the hearth, which is full of potatoes and onions. But back to Windows Calendar. I like it, but I am not using it in the way that its authors intended. I started out by using a day to make Gareth his own schedule. Gareth's schedule is easy. Gareth likes to work independently. He does not like anyone hovering over him while he does his work. This means that all I need to do is give him the books, let him know what my expectations are, and spend about thirty minutes or less going over his work when he's done with it. After we get past the rocky adjusting-to-the-new-routine period, my responsibilities overseeing his education are not that hard. After I did Gareth's schedule, I went on to Katydid's. Here I ran into trouble. Katydid will be in the fourth grade this year, and she does not always do well when asked to work independently. She needs me to work with her in a few subjects, most notably math and Latin. It should be easy to work two subjects into my day, right? Um. Have I mentioned that I've been researching sensory integration issues with the twins? It's gotten to the point lately that I can't do much else when they're awake but be with them. If I try to read aloud, even while they're eating, one or both of them will yell, fight, throw blocks, dump toys, hassle the baby, and just generally make it impossible for me to read. (By now I'm pretty good at reading over and around chaos. Believe me when I say they are making it impossible to read.) Behavior of this general sort goes on all day. The boys have always been just a little MORE than your average kid: MORE intense, MORE active. But lately it has escalated to the level of breakdown -- which would be mine and Andy's, thank you very much. Anyway, the sensory integration road is no stranger to us, although when we have trod it in the past it's been for sensory defensiveness, not sensory-seeking. Still, I know the drill: behavior improves when appropriate activity is built into their day. In the case of sensory-seekers, a lot of jumping, swinging, heavy lifting, pushing, pulling, stuff with weight to it. Okay, so when the twins are awake, I need the older kids to be very independent. What about when the twins are asleep? By the time the twins go to sleep, I'm shot. I need a break. And, oh yeah, Chipmunk naps in twenty minute intervals in the afternoon. Sometimes it feels as if my day is a special needs roulette wheel. We'll just give it a spin and see what turns up next. Sensory defensiveness? Got that. Sensory seeking? Got that, too. Visual processing problems? Yep. ADHD? Yep. ADD without the H? Oh, yeah. Tourette Syndrome? Now, where does math go? Windows Calendar doesn't seem to have a function for this. I'm sitting here in my living room at the learning table, eating the last of the leftover barbecued chicken from Memorial Day and drinking a Pepsi (which I probably shouldn't), and trying to get my thoughts together. Lately I have been feeling awfully scattered. This happens, I guess, when you find yourself moving in a million different directions at the same time, and your routine has been upset, and you're not getting any sleep, and you're anxiously awaiting test results that might provide a clue as to the origin of your nine year old daughter's persistent headaches -- or rather headache, as it hasn't really disappeared in almost a month -- and the lab has already screwed things up once and so you're waiting longer than you ought to. We're in one of those months right now when it seems like we ought to have about two standing doctor's appointments a week. Yesterday I brought Farmerboy and the twins in for an angry red rash all over their faces and arms. Fifth disease. It's going around. Guess where they probably picked it up. My husband is convinced that doctor's offices are just a racket. You bring one kid in because she's sick. While you're there, everybody else is exposed to a few million germs they wouldn't have been exposed to had you not had to take everyone to the doctors office, thus insuring that you will be back next week, copayment in tow -- whistling to the tune of $75 yesterday, not to mention $25 worth of gas, and they put us in the room with only one chair. Now where was I? Oh, right. Scattered. Anyway, as I've mentioned before, I have a problem with my executive functions. As in, I don't believe I really have any. At times like these -- especially when sleep deprivation becomes really chronic (and you must understand that I can probably count the number of nights I've slept through in the past 11 years, so I'm talking about really interrupted sleep here, not just getting up once or twice a night) -- I have a hard time remembering my own name, let alone what I was planning to cook for dinner 5 minutes ago. So, where was I? Right -- dinner. Last night I just put some bacon in a pan and started frying it with no idea what it was going into or what else we were going to eat. But I had defrosted it on Friday before I realized that no one would eat what I was planning on making, and I needed to cook it before it went bad. It was our last package of bacon. (We buy only local meat, in measures such as "half a pig", "side of beef", "one lamb", etc.) You'd think it would disappear among some fanfare. Bacon. Anyway, Andy came home and found me frying bacon and asked what was for dinner, so I told him I didn't know, I was just frying it, and he said, well, why don't you let me make eggs, and so I did and that was what we had for dinner: bacon, eggs, and toast. The kids ate it in front of the TV, watching the rest of a movie they'd started Monday, and I must confess that I ate mine in front of the computer. Then Andy let me run up to the convenience store for wipes, all by myself. Usually we eat a real meal at the table, mostly consisting of the grownups telling the twins to sit down and stop -- whatever it is they happen to be doing. Yesterday I felt like somebody had rubbed sand in my eyeballs. Chipmunk got his first tooth Monday night, so you can probably imagine how much sleep I got. Then there was the trip to the doctor, insuring that the twins got very little nap. I don't even remember now all the stuff they pulled once we got home, but jumping off the coffee table figured prominently, and Gareth and Katydid were cutting down each other's favorite plants. And what was I talking about? Back in May, I wrote a post titled "ADD and Me" about how my quest to help my daughter with her organizational skills led me to view my own organizational difficulties in a different light. In some of the ADD literature -- and I can't remember now where I first encountered the term -- one runs into a condition identified as "overwhelm": otherwise known as, "I can read way too many variables into this problem which seems to have an infinite number of solutions but cannot because probably only a handful will be good solutions and the rest will be bad, and so my executive functions have gone on strike and I am going to sit on the couch and eat chocolate." This happened to me the other day -- although, alas, I did not have any chocolate. What I did instead was to stand at the kitchen island and peruse the L.L. Bean Home catalog. (If I can't achieve those crisp made beds and white-washed beach house walls, at least the pictures are soothing.) I was trying to make a household notebook and a personal notebook. The household notebook would have a master list of routines and chores, maintenance information, menu planning, local farm information... no, wait, maybe the farm information should go into a recipe notebook, along with menu plans and that stuff about how to start a pantry, but where will I put the canning information? Should that go with the recipes or the garden planner? Should I have a garden divider in my personal notebook? I really want that notebook to be whatever's current, so I have something to contain whatever it is I'm thinking about right then. I have a ton of printouts sitting on the couch with me; how will I decide what to stick in my notebook and what to file? So maybe you can see why I turned to L.L . Bean. At a certain point, I have to stop and ask myself: are all my efforts really making my life easier? Or are they merely complicating it? Am I trying to force myself into becoming someone else, or is this working with (and for) who I am? This is the kicker for me: so many of the planning tools that other people use with success only become clutter for me. And believe me, the last thing we need around here is more clutter. On the side of my refrigerator, I hang other papers I need to keep up with on a frequent basis, as well as a poster showing what to do if a child is choking. So below this poster I have the kids' attendance charts (required by New York state law), Gareth's headache diary, a couple of numbers for local emergency contacts, and a magnetic notepad, thoughtfully given me by my mother-in-law, where I am jotting down things that might make our house run more smoothly as I declutter and work on routines. I recently hung up a clipboard like Dawn's right above my file crate, which sits at the edge of the kitchen counter by the phone. I think that since it's hanging up, it might work to put a to-do list on it for the week. (I can't do daily to-do lists because they just discourage me. Spreading things out over the week is much better.) I find I don't use my file crate in quite the same way Dawn does; I usually forget to check the folders ahead of time, which explains why I haven't used Magnifikid since we got the subscription. Before Chipmunk was born, I was far better at using the files for their intended purpose, but as life got more hectic, I found myself just piling up the kids' work on top of the crate. Fortunately, there is a limit to what you can pile on top of a file crate, so I was forced to file the work before it became hugely unmanageable. Now the kids just automatically put their papers on top of the file crate, and I'm trying to be better about putting them away. I've also found that the file crate serves another important purpose for me, which is to hold all my other notebooks and journals. I have a small spiral notebook that I use for brainstorming homeschool ideas, and a journal I just bought (in brown, because I thought I could decorate the cover) to noodle around in (so far I've made a lot of lists and noted birds and weather.) I also have a nice, non-hangable, magnetic clipboard (Christmas present two years ago) where I keep my long-hand writing and any printed manuscripts I'm currently working with. All of these slide nicely into the file crate. Then there is the computer. I love keeping my learning notes in blog form. I thought I might do the same for some of my housekeeping lists. But I really think they work much better when slapped on the refrigerator or a bulletin board. And as far as lesson plans go... that spiral notebook is really a workhorse. I don't look back at it much, though, which is a problem. But organizing our home library into book bins by subject, keeping an amazon wish list, and reading blogs helps immensely when I'm trying to figure out what we're going to do next. I do need those new notebooks, because I have loose paper in search of a home. But when I get past the overwhelm, I find their importance much diminished. For me, simpler is better. I could stand a few more magnetic pads to keep different lists (a running grocery list would be nice) and we are in need of another bulletin board where I can put up laminated copies of our daily routines and chores. I also think that every room should have a place for "This is how you clean this room" posters, but haven't managed them yet. It's all pretty low-tech and nothing original, but let's face it: anything more complicated and I'd be spending a whole lot more time with the L.L. Bean catalog! I'm rereading a book by Lorrie Flem called Welcome Home, Daddy. In fact, I was rereading it last night in the rocking chair while we were finishing up our frozen pizza in the front of the TV. My husband asked me what I was reading and I showed him the cover and he laughed. I suppose if I can't actually get all the stacks of books off the dining room table so we can eat in there, I can at least read about people who do have clean tables for inspiration. 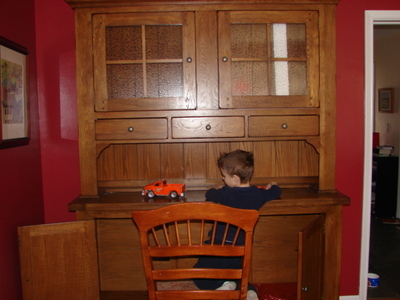 Apparently china cabinets are actually built for hide and seek and keeping your trucks away from toddlers. Who knew? My dear, dear husband keeps patrolling through this room issuing orders: "NO TRUCKS ON YOUR MOTHER'S NICE FURNITURE!!!" Of course, what am I thinking about the other cabinet (no hutch) which we're using as a sideboard? I think I could make these Montessori shelves... Wouldn't that be a great place to start seedlings? But no, no, no! We are going to put a pair of candlestick lamps and a lace doily on that sideboard, because this is the image I have in my head of what other people's dining rooms look like. (I'm operating at a bit of a disadvantage here because in my house growing up, our buffet was always piled high with my dad's airplane magazines. I just thought that was what it was for, you know?) It still has potential as a Montessori cabinet, though. The china cabinet, however, really is going to be for china. (A novel concept, I know.) Well, and maybe canning supplies, because they don't really fit where I have them. Lately I feel like I am slowly becoming a grown-up. I don't mean that in a bad sense -- because I tend to think that no one should grow up so much that he or she loses that child-like sense of wonder that keeps life interesting and exciting -- but in the sense that I am finally learning to let go of childish resentments and mythologies surrounding housework and homemaking. As a child, I had many chores, but I generally resented having to do them. It was never made very clear to me that chores were important, not just because my mother said to do them, but because a clean house is more satisfying than a dirty one, in a family everyone contributes to the well-being of the family, and also that I was going to have to keep my own house one day. When Andy and I shared our first apartment at the ripe old age of 19, I had managed to retain some of the routines which my neat, organized, and competent-around-the-house mother had tried to instill in me, but our very first week trouble reared its ugly head when it became clear that my dear fiance (we made a few mistakes along the way) had never actually had to help around his house growing up. We were both in college, but I had a job and he didn't, and I distinctly remember fuming over this while scrubbing the bathtub and watching him put his feet up. Being 19, instead of discussing things like rational adults, I just determined that if he wasn't going to do anything then I wasn't either, and the slide into chaos began. Both of us have come a long way from those days, of course, and we no longer fight about chores. (After 16 years together, we work as a team now.) But it's hard to rebuild routines and habits after they've been broken... or to develop new ones completely from scratch, especially if you're also in the middle of raising a growing family. If I could have dispensed with the idea that I was being punished by having to care for my own home, our lives would have gone a lot smoother. And I have heard my husband tell his mother more than once that she should have made him help around the house. I make it a point to let my kids know how much their contributions around the house count. The simple truth is I can't do it without them. I want to make sure that they know this. The house will not run at all if they don't do their part. I make it a point of reminding the kids periodically that they do not like a messy house either. They know they like the house better when it's clean. I try to be patient in training the kids in doing their chores. I try very hard not to just do it over myself. For one thing, there is nothing quite as disheartening as watching someone do over the job you've just done. (Think about this for a second. How would you feel if you'd just gotten done folding the laundry and someone came along and refolded it all?) For another thing, they'll never learn to do the job at all if I'm constantly fixing it for them. Still, checking chores is something I fall down at. One of the things that has helped us the most as our family has grown is to have regular chore times every day, when the same chores are done. This may seem like a no-brainer to more organized people, but I hadn't really managed this too well until I read Managers of Their Homes. About a year ago, I read Managers of Their Chores and, while I've never gotten around to doing the ChorePacks, this book did show me that one of the reasons why my house was still in a fairly chaotic state was because I still didn't have enough chore times worked into the day and because I was still treating my kids a little too gingerly. I don't want my kids to spend their entire day doing schoolwork and chores, but it isn't asking them too much to help clean up after dinner and pick up before going to bed. Decluttering probably is a no-brainer, but I grew up in a family of packrats, so I'm a little slow on this one. Although I doubt that I ever get as much aqccomplished in 15 minutes as Flylady does (Flylady doesn't have toddler twins), focusing on doing what I can for brief periods of time is definitely an improvement over letting everything go the way I would have in the past, and generally workable for pregnancy. Most important of all, however, is the change in my attitude toward housework. As I get older, I have come to see the work involved in keeping house more in terms of making a home than of onerous drudgery I need to avoid at all costs in favor of something more interesting. Don't get me wrong; I still have my bad days, I still don't really enjoy a lot of the work, and I'd generally much rather be outside. But I have begun to think of the work as worthwhile, which is a step in the right direction. These posts from Nina and Jennifer about what life is really like outside the blogosphere made me laugh. Because Nina's dining room table could be my kitchen island. And I crop all the weeds out of my garden photos, too, just like Jennifer. (I mean, I try. Except that there were really more weeds than vegetables in our garden this year, and so it probably would have been easier to crop out my pea plants than it would have been to crop out the wild radishes. Actually I guess I ought to admit to cropping around the messes in my house, too. Unless the babies made them, because that's just an excuse to post baby pictures). I really do try to resist the urge to airbrush our reality too much, though. I do that for a couple of reasons. One reason is that I can just imagine my husband asking, "Whose house was that anyway?" if the spit and polish got a little too shiny. The other reason is that I like to know that I am not alone when I am laboring in the trenches. Therefore, (I reason) there are probably other people out there who want to know they are not alone as well. And so I post about our bad days. And I post about our good days. Because that's our life. It's not all roses and summer afternoons, but neither is it all dark clouds and thunderstorms either. It's both. Life is like that. Farmerboy: This is my little hand (waves his right hand) and this is my big hand (waves his left hand). Me: Oh, because you're left-handed, that's why you think your left hand is your big hand. FB: No, I use my right hand. Me: But you use your left hand for most things. FB: No, my right. (***He really is left-handed, though! ***) Is push a bad word? Me: Yes, pushing is mean. Me: It's mean to push *people*, Farmerboy. FB: Mommy, are you scared? Me: No, they're just shadows of furniture. FB: Or maybe of a guy coming to take some of our plants outside. And then he took off to his sister's room, leaving me trying to put Pop to bed and wondering if Farmerboy knew something I didn't, and why anyone would want to steal a bunch of dead tomato plants. And that's what life is like tonight, here at Three Plus Two. I started writing this post on Saturday, but didn't get a chance to finish it. It's not very exciting, but what the heck, I think I'll post it anyway. I'm always curious about how chores work in other people's houses, and how much work my kids do in relation to other people's kids. They're also supposed to pick up their rooms at quiet time, but they often forget -- Gareth more than Katydid, who has been doing a pretty good job of keeping her floor neat. The thing of it is, most of these chores fall to me, Gareth, and Katydid, because everyone else is either a)gone most of the week (Andy) or b)three years old or younger. Farmerboy likes to do work, but cannot be counted on for many regular chores yet; we have him assigned to silverware and picking up the Duplos, which the babies usually dump everywhere. Gareth and Katydid shoulder a lot of work around here, and I make sure they know how valuable their contributions are. This is something my parents never really told me, and I think it fed a lot of my resentment toward chores. So I make sure that my kids know that the house wouldn't run without their contributions, which is only the truth. In any case, trying to figure out where to put the weekly chores is a hurdle we haven't jumped yet. On Saturday, we worked on organizing my bedroom -- home to Farmerboy's books and toys -- and I cleared out our magazine and catalog basket(s) and started on a binder system. But our decluttering/organization progress will have to wait for another post, because Gareth is done sorting laundry and now it's time for math. The day after we came home from the hospital, I realized that (a)this was our seventh week of a "school" schedule; (b) the house was completely falling apart; and (c) everybody was really, really tired. Katydid needed another day of convalescence at home to fully recover, and Gareth had a doctor's appointment on Wednesday. Since the week was pretty much shot anyway, I decreed it a catch-up week, and we've been pursuing a very light school schedule for the past few days. Here are a few of the things we've been catching up on this week. 1. Sleep. This is a biggie. Last week Pip slept horribly. Friday night I did not get to sleep until after 1 AM. When Katydid went to the ER on Sunday, she wasn't transferred upstairs to a real bed until 1 AM. I don't know what it is about 1 AM, but I really have no desire to make it my permanent bedtime. I've been trying to hit my target time of 10:30 this week. And I've been letting the big kids sleep in until 9 so I can have a little time in the mornings. 2. Cleaning. This afternoon the babies wouldn't nap, saving me from the awful fate of sitting down -- alone! -- with a cup of tea. I think the dining room and entryway now qualify as "liveable", but I'm still working on the kitchen and the laundry room. And the learning room needs reorganized. My Montessori Services box came today, though, which should help with that. 3. Organization. I finally decided that my head would not explode if I reread the posts about homekeeping notebooks by Elizabeth, Kim, and Dawn. In fact, I decided that my head would not explode if I ever-so-carefully thought about maybe trying to make a notebook that might be kind of like one of theirs. Then I started making all the phone calls I needed to make to follow up on Gareth's testing from this summer. And I realized that not only did I need a homekeeping notebook that functioned as a sort of respository of all knowledge, but I also desperately needed a Special Needs notebook. This notebook (thought I, oh so carefully) would need to serve as a holding tank for all the stuff generated by all the adults who are trying to figure out my son. Right now most of the many, many articles on the many, many conditions that Gareth may be dealing with are either sitting on my desk or stuffed in a big manila envelope. Then there are all the professional evaluations that need a home, the numbers and names of recommended doctors, booklists... etc., etc. So very carefully I theorized that I might practice on a couple of notebooks before tackling the Holy Grail of notebooks -- the Home Companion. Those two notebooks would be called "Ideas for School and Home" (a place to put all the great ideas I find on other people's blogs!) and "Special Needs", which will be a home for all the various special needs resources and paperwork for all my kids (since Gareth isn't the only one who has had or may need special services.) I've started on the Ideas notebook already, and I'll post pictures of the notebooks when I'm done. 4. Preparation. Revamping the learning room falls under this category, as does sitting down with the NAMC Math manual I ordered for Katydid. (She'll be working on some of the more complex material, but she isn't ready for the elementary manuals yet.) With any luck, we'll be able to start again fresh on Monday!